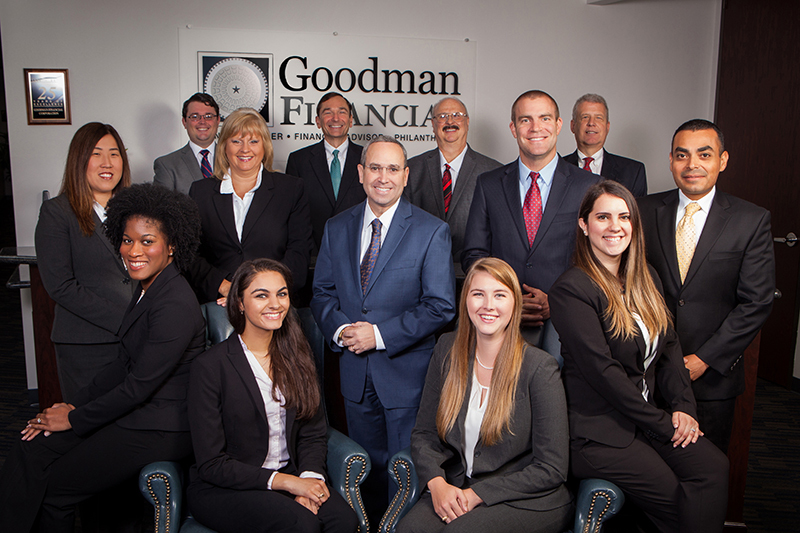 Goodman Financial’s personalized approach to investment management emphasizes portfolio management that is custom tailored to the needs of each client. 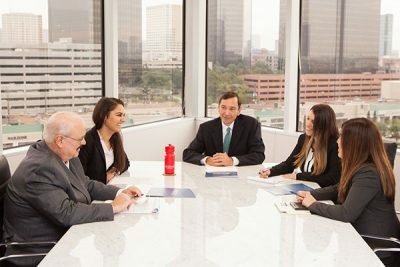 We listen carefully to you to gain a thorough understanding of your unique goals, risk tolerance, time horizon, and other circumstances. We use that information to develop an investment strategy for you. Your investment strategy provides a framework for determining an asset allocation that balances risk and reward over a long-term time horizon. Asset allocation and diversification are key to prudent portfolio management, and risk management is an important consideration of our investment philosophy. While our security selection process seeks to provide long-term capital appreciation, we aim to find growth opportunities within your risk tolerance. 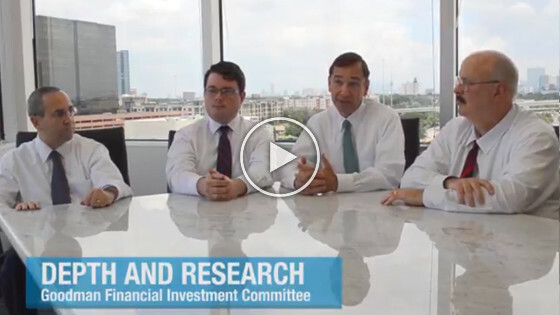 We have an in-house Investment Committee dedicated to conducting the research we use to make investment decisions. They use a dynamic and disciplined investment approach when making investment selections. We use both a top-down and bottom-up approach to investing, performing in-depth research of the company and analysis of the industry, economy, and political climate as a whole. Only after careful analysis do we invest in equity and fixed income securities that meet your investment objectives. We continuously review investment alternatives and implement changes when more attractive investment opportunities become available. With limited exceptions, each client’s assets are invested in individual securities, not in mutual funds. 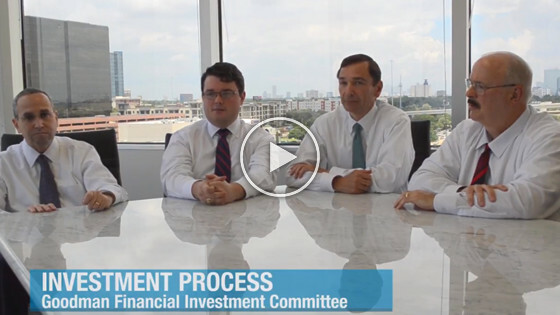 This approach provides clients lower costs, greater flexibility, and more tax efficiency. Our fixed income selection process aims to generate income as well as add stability to your portfolio while focusing on safety. We diversify among issuers, sectors, and industries to help manage the credit, interest rate, market, and other risks the fixed income portion of your portfolio is exposed to. We lower turnover costs and provide a more predictable income stream by generally holding bonds to maturity. We ladder your individual bond portfolio over time horizons that are based on your needs and the prevailing interest rate environment. In periods of rising interest rates, we generally use a shorter ladder so that as bonds mature each year, we can re-invest the proceeds in higher-yielding bonds. In periods of decreasing interest rates, we generally ladder individual bonds over a longer time period to reduce the impact of declining rates on your portfolio. 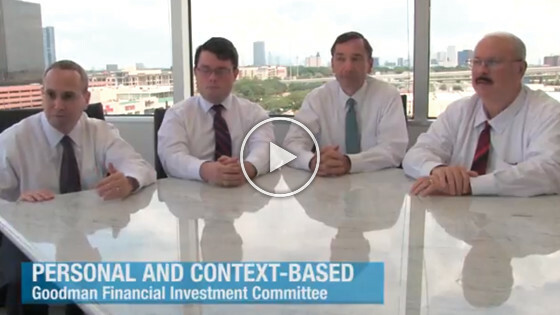 Fixed income portfolio decisions are only made after the price, yield, maturity, and quality of the security and the underlying company and industry have been analyzed and researched. All these factors are evaluated within the framework of your own unique investment parameters. We consider the universe of government, agency, investment-grade corporate, and municipal bonds, as well as your risk tolerance and tax profile when selecting bonds. We continually monitor fixed income holdings, the interest rate environment, and overall market conditions affecting your fixed income portfolio. Read more about our oversight here. Our equity selection process aims to find individual stocks that are intended to be held for the long-term with an emphasis on capital appreciation. We typically aim to maintain a balance between growth and value styles, as well as diversification among large, mid, and small cap companies. You can reduce the risks associated with market timing and avoid having to speculate which segment will perform best in each period by having an equity portfolio that remains diversified in terms of style, market capitalization, industry, etc. 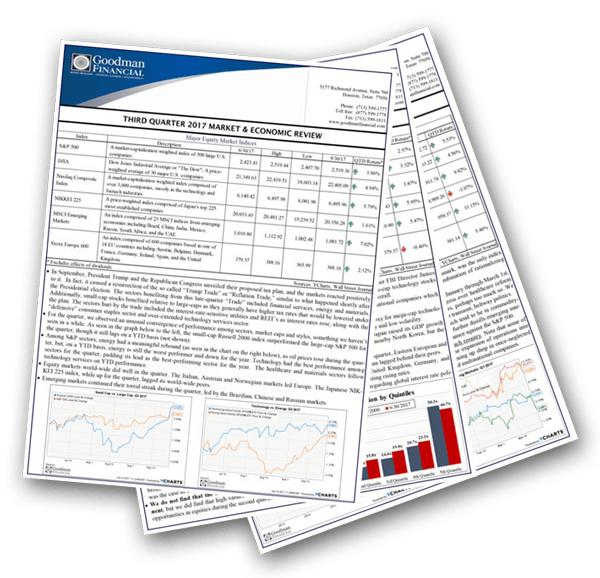 Our top-down analysis entails a broad survey of the domestic and international economic and financial landscapes, attempting to identify investment opportunities and areas to avoid. We examine the data to identify current and emerging trends, and then we use those observations to identify specific companies to research further for potential inclusion in our clients’ portfolios. After a stock is added to your portfolio, we continue to monitor it in light of its own metrics, but also in terms of overall market and economic conditions and your own investment strategy. We believe the “one-size-fits-all” strategy is inappropriate when it comes to investing, and work to provide a portfolio customized personally for you.